Featured in The Sunday Times as one of Europe's Top 50 villas.Manoir Gascon is not just a villa. Manoir Gascon is designed to thrill the senses and to fully transport you to this quintessentially charming part of South West France. Themanoiris beautifully furnished with contemporary pieces, antiques and art. Special care has been taken to maintain the original and charming patina. Here it's all about warmth, character and authenticity. The two historic ‘salons' are at the heart of the house and perfect places to gather at any time of the year. Outdoors, two charming dining areas set the scene beautifully for lavish alfresco meals of foie gras, duck, cheese and other local specialties, and a heated swimming pool and games barn keep everyone entertained. The setting is private and rural and yet a vibrant Gascon village is just a 10-minute walk away or bike ride along a country lane. Besides a restaurant-cafe at its centre, it also has a bakery, butcher, pharmacy and even a tennis club (rackets provided back at the manoir) as well as a striking red bullring which is over one hundred years old and the stage for the traditional ‘Course Landaise'. If you need a large supermarket or other restaurants you need only travel to Cazaubon (12km), Nogaro (12km) or Eauze (20km) and there are some great weekly markets in Eauze, Barbotan-les-Thermes and Vic Fezensac. Other typical local towns and villages worth visiting are La Bastide d'Armagnac, Aire sur L'adour and Euginie les Bains. The area is also famous for the historical racing event held at the Nogaro circuit as well as the biggest jazz festival in Europe held at Marciac. Even Bordeaux, Toulouse and Pau (vintage motor racing in May) are within easy reach. 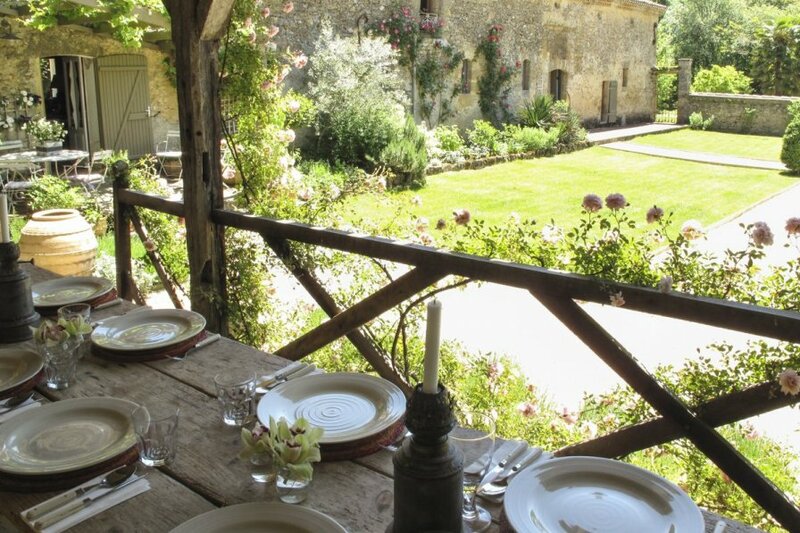 The local village (1km) is just a ten minutes walk along a country lane from Manoir Gascon. A vibrant village with a bakery, butchers, local pharmacy and a very welcoming restaurant-cafe where you can go for a morning coffee, lunch or evening meal. One particularly striking highlight of the village is the bull-ring, over one hundred years old, where you can watch the ‘Course Landaise', a slightly different version of Spanish bullfighting. On a Thursday be sure to visit Eauze (18km), the capital of Armagnac, where you will find a glorious market selling fruit, vegetables, cheese from the Pyrenees, seafood from nearby Atlantic coast and local sausage made with figs, nuts and herbs as well as the famous ‘Eau de Vie'. If you have a taste for Armagnac, there are plenty of opportunities to visit local producers and guided tours as well as tastings can be arranged. Other noteworthy villages and towns in the area include the thermal spas at Barbotan Les Thermes (12km), a thirteenth century fortified village, Le Bastide d'Armagnac (40km) and Marciac (50km), home to a well established jazz festival.